The Marisol Complex is a low density complex. ****THERE ARE ONLY ABOUT 20 RENTAL UNITS IN THE ENTIRE COMPLEX*****. Therefore this is one of the least crowded pool areas on the beach. You almost never have to wait on an elevator your entire stay. During the summer at some complexes you will spend 30 minutes waiting on an elevator every time you try to go to your condo. 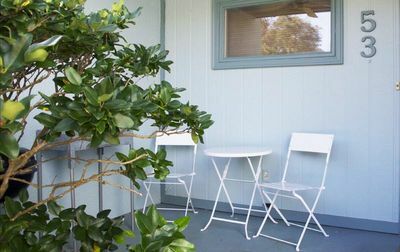 In season (March -October) 2 sets of 2 padded beach chairs and umbrella are included with this rental at no additional charge for the entire week. This is a $200 value per set. $400 total value at no extra charge to you. 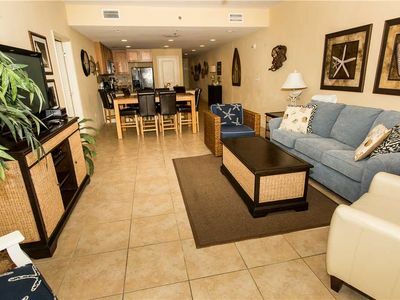 MariSol 705 is a roomy 4 bedroom beachfront condo that provides a great backdrop for a family fun vacation. 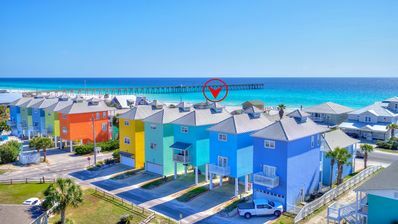 There are no other 4 bedroom condos in Panama City Beach with the size and layout like this one. But let’s start with what makes this the perfect spot. 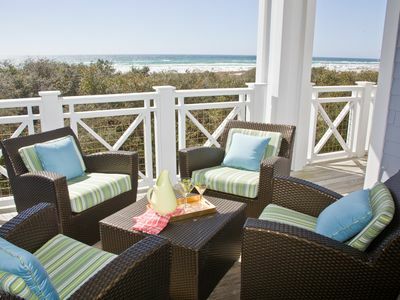 Step out on the balcony and the first thing you’ll notice is the breathtaking views of the Gulf. 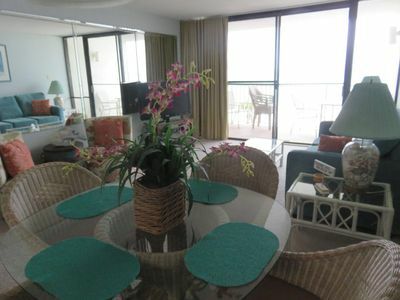 MariSol is built close to the beach so you get stunning views of the beach and water. 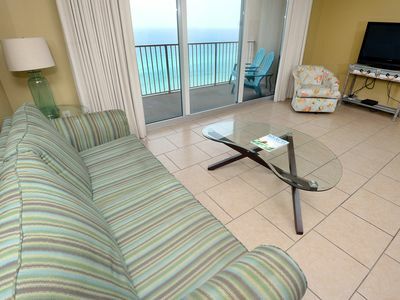 You'll want to spend all your time here because you have wonderful views of the beach and gulf. 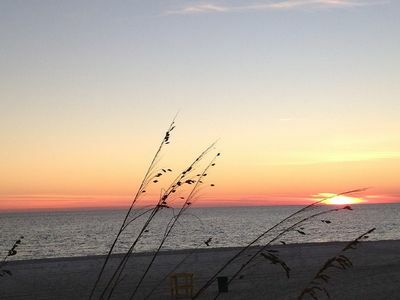 You’ll really enjoy the spectacular sunsets to the west. A great spot at the end of a great day. Every room in MariSol 705 is special. The living room well appointed. It features a comfortable sofa that opens into a queen sleeper. The photos show how roomy and comfortable the living area is. Plenty of room for the whole family. It has a large flat screen 55" HDTV. The open gourmet KITCHEN area is well equipped and gives you great views. 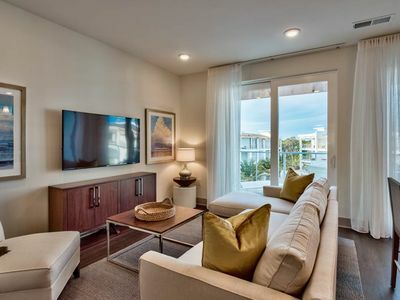 Plus, it features beautiful granite counter tops with attractive cabinets and stainless steel appliances. It’s fully stocked so no matter whether you’re cooking your specialty or just fixing mac and cheese for the kids you’ve got everything you need to please the family. 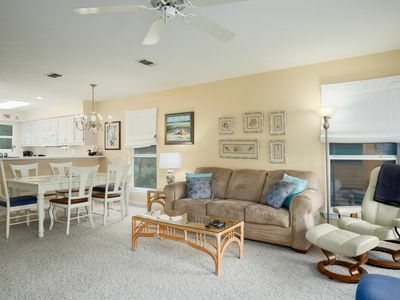 The DINING AREA comfortably seats 8 plus 3 at the breakfast bar and offers beach views so the family can share meals and trade their favorite part of their days at the beach while enjoying all the beauty of the gulf. The MASTER SUITE features luxurious KING bed and private bath. There’s plenty of space to store your beachwear in the spacious closets. 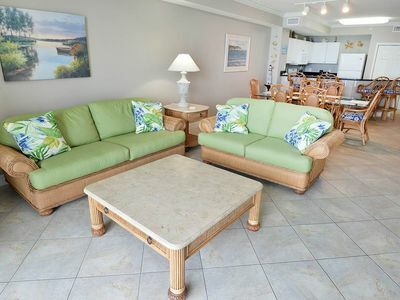 You’ll notice the large 40” flat screen TV that makes for great viewing when you’re relaxing after an activity filled day in Panama City Beach. You can step out onto the balcony from the MASTER SUITE which is really nice. The SECOND MASTER is equally well appointed with a KING as well. And plenty of space for everything you’ve brought to the beach. 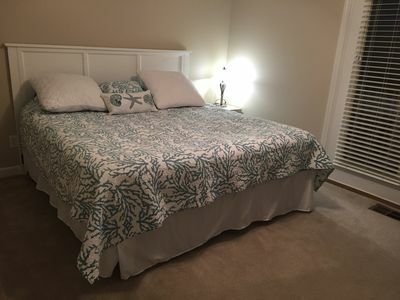 This large bedroom is a great hideaway with lots and lots of room. There’s also a large 40” flat screen TV in this large SUITE. The THIRD BEDROOM is equipped with a full size bed with a twin size bunk over top of it. PLUS an additional QUEEN SIZE BED. This bedroom can sleep a couple in the queen size bed plus 3 kids in the full/twin bunk bed. It has a 40" large flat screen tv. 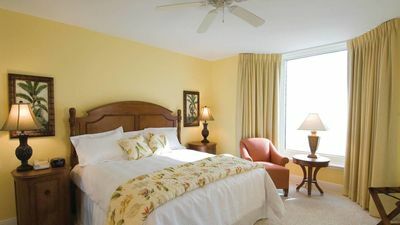 The 4TH BEDROOM or very large efficiency suite has a KING SIZE bed. It has an en Suite large bathroom with a jacuzzi tub and walk in shower. It has a 49" large flat screen tv. These bedrooms along with a pull out sleeper sofas allow the unit to easily sleep 14 comfortably including 3 complete baths. 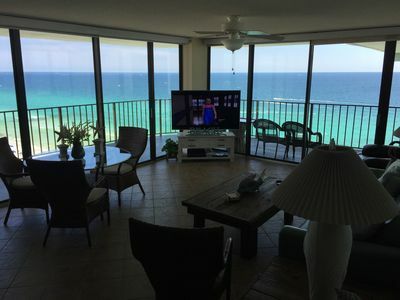 If you are looking for the finest vacation available in Panama City Beach MARISOL 705 is just the place for you and your family to enjoy a truly memorable beach vacation. 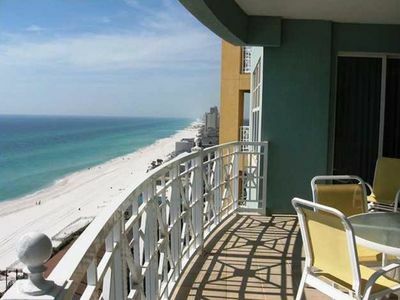 Condos this big go fast, so call now and book your family vacation now! It may not be available later. Tidewater 1111 - Don’t miss your spring vacation. Book now! 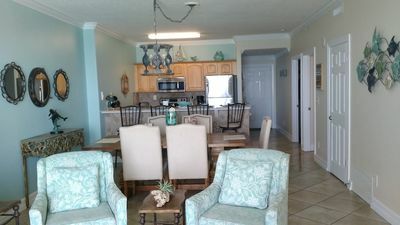 Awesome Condo At Gulf Highlands With Golf Cart!! 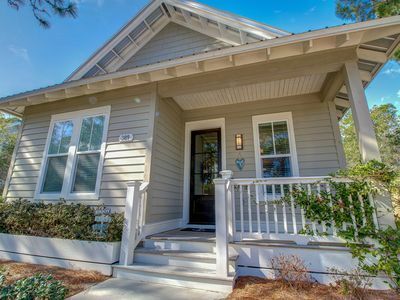 New Build Seacrest Beach Home - Private Saltwater Pool! SANDY JOY! OPEN 4/14-18 NOW ONLY $1560 TOTAL! STEPS TO BEACH AND POOL! Last minute Getaway? Dates available for April& May. Best Balcony on the Beach! 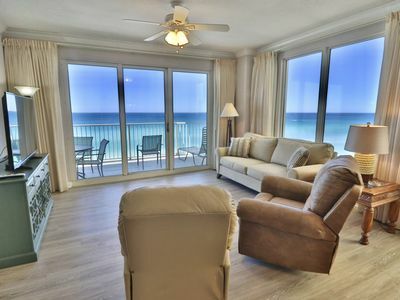 For Stunning Gulf Views And Evening Sunsets #1322 Is Your Home Away From Home. 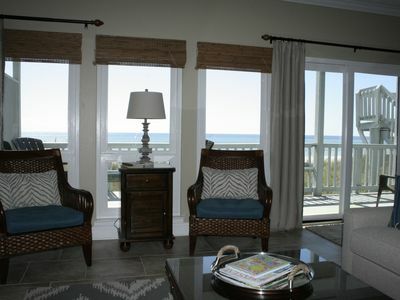 Tidewater 0502 - Don’t miss your spring vacation. Book now! 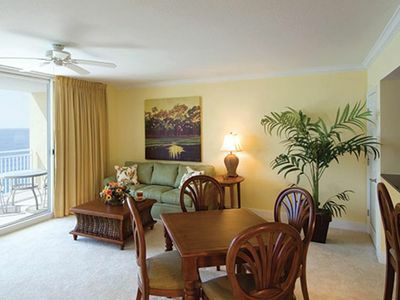 The Pointe 345 - Booking spring vacays, now! 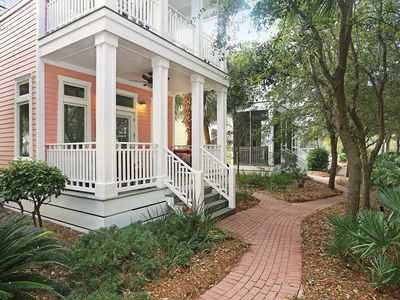 Adorable Gulf View Beach House 1/2 block from Pier Park! Vacation in This Gorgeous 2 Story Home! 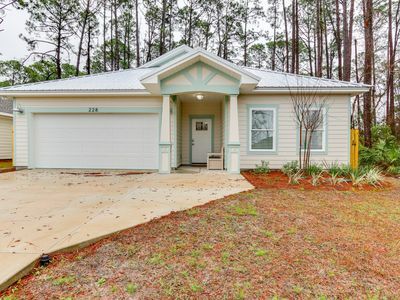 3 BR / 3 BA! Sleeps 8! NEW LISTING! Cozy 2BR 1.5BA townhome with parking!